I don't know the total turnout, but crowds stretched from the doubly fenced-off area near the Lincoln Memorial well past 17th st. 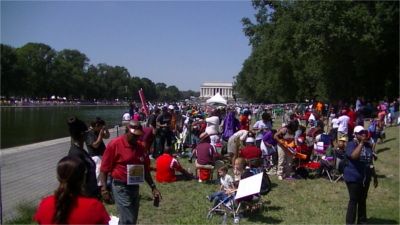 The DC Statehood march alone was larger than most actions here in DC on any issue. DC Mayor Gray spoke at the DC statehood rally at the DC War Memorial, avoiding issues of economic equality within the city. Shortly therafter, DC Councilmember Phil Mendelson spoke about the living wage bill (LRAA) as part of continuing what Martin Luther King fought for.